“You made this? Whoa, good job!” he said. I stared back, eyes wide, and attempted to process those words. Unfortunately, after what was probably far too long a pause, all my addled brain could come up with as a response was, “Um…well…good job playing hockey!” The last words came tumbling out. A very small corner of my brain screamed a warning, “Lame! Lame! Lame!” but the words slid out unimpeded. An inward sigh. 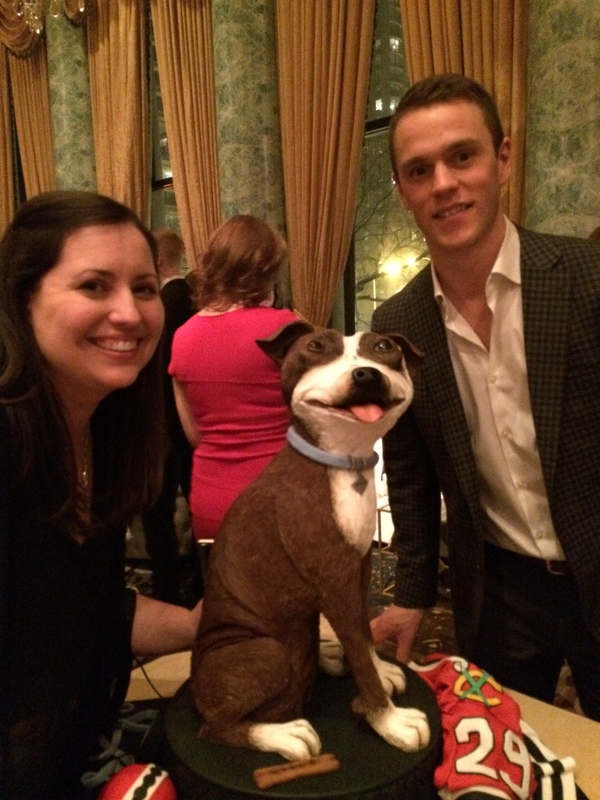 Alright, so perhaps my meeting with Chicago Blackhawks Captain Jonathan Toews didn’t go quite according to plan. 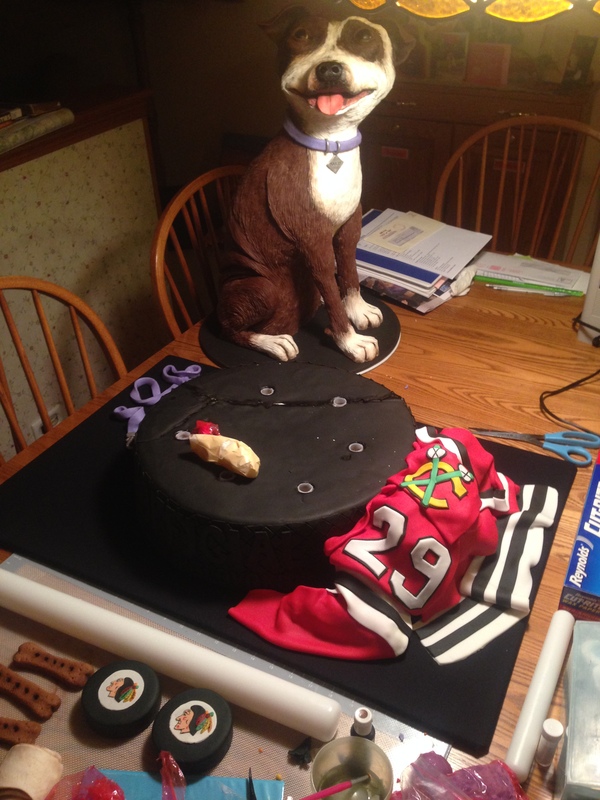 But he was kind enough to sign a photo of the other Blackhawks cake I made for WGN last spring. In fact, I was able to meet many of the players that night and all were incredibly kind and gracious. Their reputation for being accessible, fun, and “normal” was certainly evident. 1. 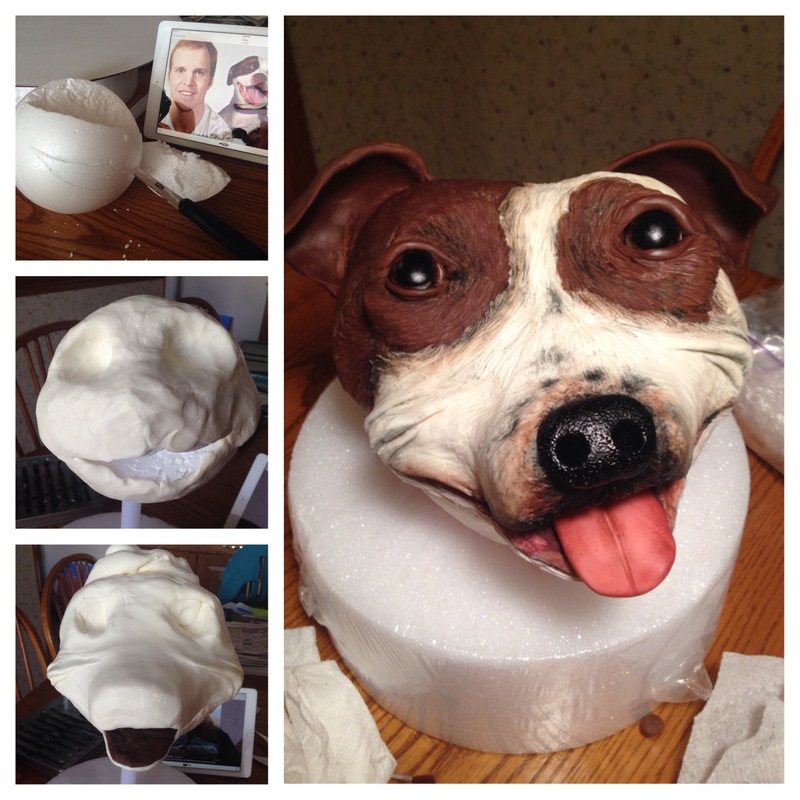 Carve styrofoam ball in general shape of dog head. 3. 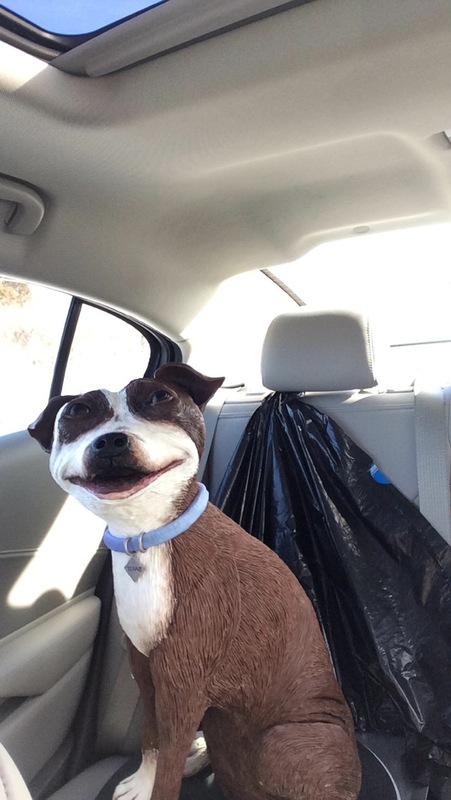 Add modeling chocolate until it has the proper shape and color of your dog. 5. Using a paintbrush, dab on black, brown, and pink luster dusts to add dimension and shading. 1. 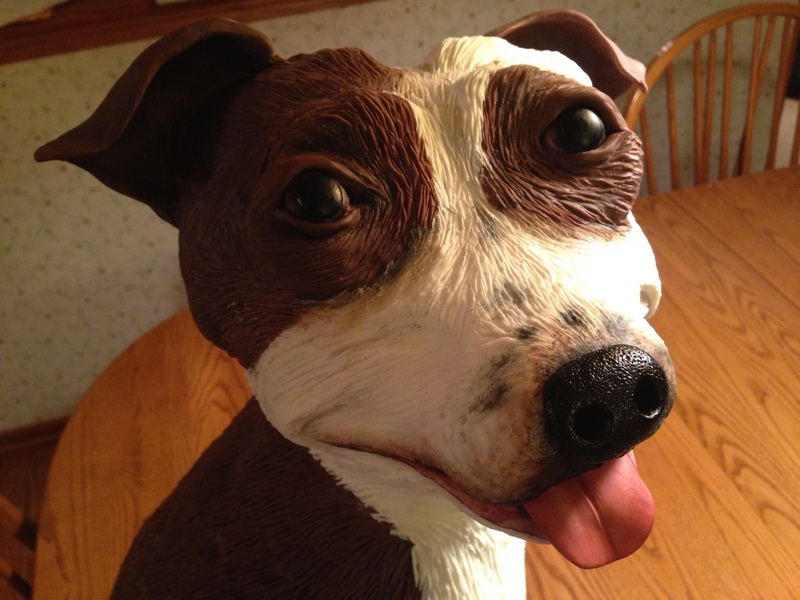 Go to the hardware store and bother the workers with this question: “We are trying to make a life-size dog cake. Can you help us make a skeleton? 2. After they laugh at you, walk around until your parents find the appropriate wood, dowel rods, shims, screws, and general doo-hickies to make it happen. Then, have them put it together for you. 4. Keep piling on the krispies! You have to really push them in together, squeezing from all sides. If it’s not compact, it will not be secure. This dog was 11 whole batches- and there was very little waste that I had to carve off at the end. 5. Any areas where gravity is pulling the krispies down, just shove in some modeling chocolate. It will hold it together. 6. Allow to cool completely. 7. Carve structure until it has the shape you want. 8. Cover with modeling chocolate. Try to make as smooth and even as possible. 9. A few inches at a time, apply another thin layer of modeling chocolate. Using a burnishing tool, press it in using parallel strokes so that it looks like fur. The direction of the fur should be consistent and should follow the contours of the dog’s body. 10. Once the body is finished, add the front legs with modeling chocolate. 11. Using a dry paintbrush, dab loose black and brown luster dusts where appropriate to enhance coloring. 1. Rawhide bone: Roll out white modeling chocolate and then wrap it until it looks bone-like. 2. Dog’s toy ball: The only other non-edible portion of this cake. Because I wanted a perfectly smooth appearance, I used a styrofoam ball. Notice the ball is completely smooth… how did I do that, you may wonder? A brilliant idea! It is no mistake that there is a black/white stripe down the center of the ball. I measured and then cut a circle of red fondant and then stuck it onto the ball. Do the same for the opposite side. Then, take a white stripe and wrap it around to hide the seams. I added a black stripe on top of the white (to model the uniforms’ stripes). But since my black stripe looked uneven, I then added black circles. (They were cut out with the base of an icing tip.) This not only hid the ugliness of the uneven black stripe, but it made it look more playful, like something a dog would have. 3. Hockey pucks: Roll out black fondant so it’s the same thickness as a real puck (1 inch, thank you wikipedia). Use a 3-inch circle cookie cutter to cut the puck out. 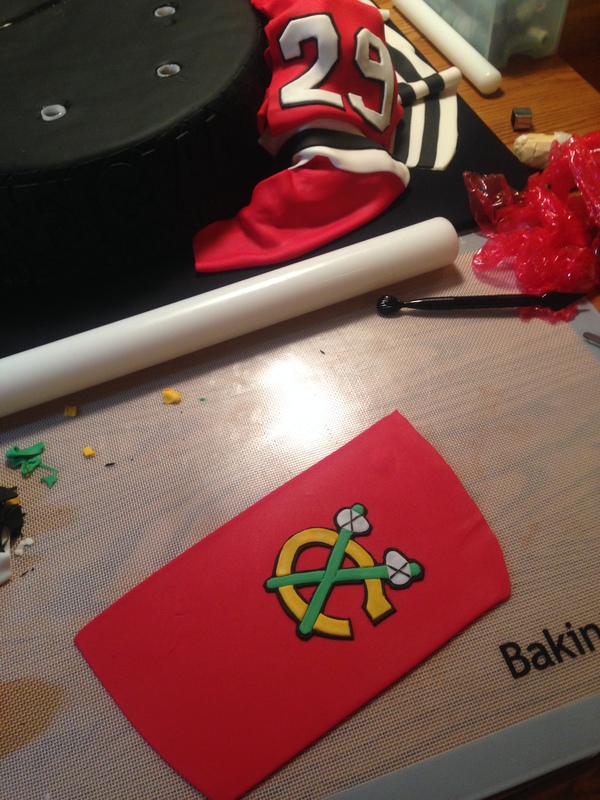 Once it’s dried, use fondant to add the team logo on top. I cut each color individually and then put them together like a puzzle. I used a black food-coloring marker to draw around the edges, like the real logo is outlined. Forgive me that it doesn’t look perfect, but seriously, these are some teeny little feathers we are talking about here! 1. Make two separate 16-inch cakes. They are GIGANTIC, fyi. 2. Cut off the domed top while it’s still in the pan. You’re more or less assured to get a straight cut that way. 3. Frost and then cover cake with black fondant. 7. Optional: greet Marian Hossa at the event by proclaiming that you, too, were “made in Slovakia.” I did NOT do this, although both my dad and brother separately suggested it. 1. Roll out several strips of red fondant. 2. Roll up some wax paper and tape it so it makes a little ball. I used several of these so the red fondant would stay “up,” instead of collapsing like a deflated balloon. You can see one on top of the cake in the photo below. 3. Lay a strip of red fondant, crumpled a bit here or there to look like an actual jersey. Then place a wax paper ball on it. Drape another piece of fondant on top of the ball. Keep going until it looks like an actual jersey. I actually crumpled my real jersey on the table and then copied the folds. 4. As you go, you’ll need to add the appropriate colors/logos/etc. This tomahawk logo pictured was fun but difficult to do: cut out yellow “C,” then cut out green sticks and white stones. Lay green sticks across the “C.” Cut and remove the yellow area under the green. 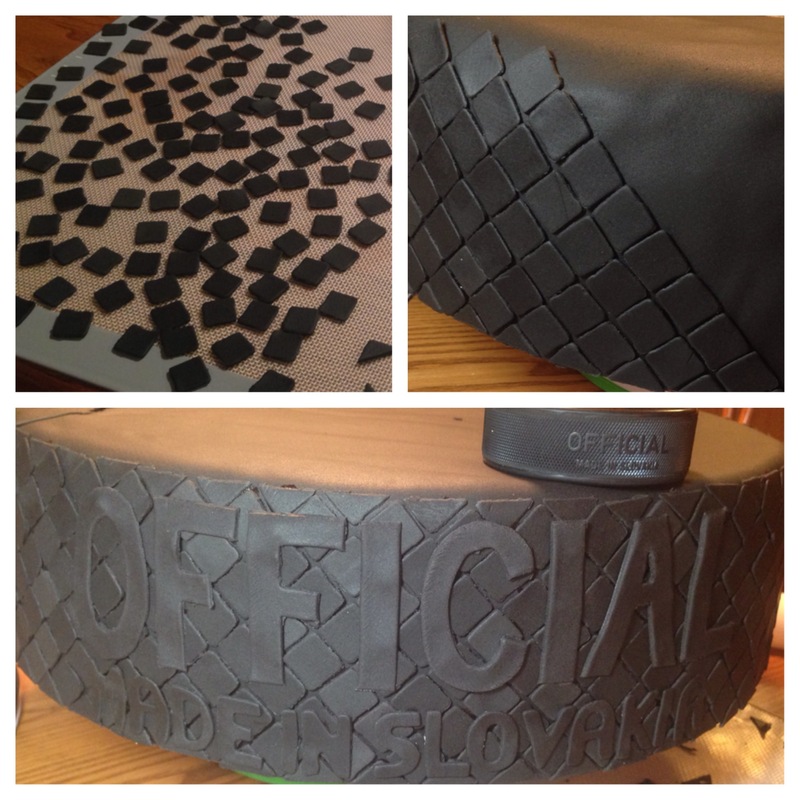 Lay entire puzzle atop black fondant. Attach with gum glue adhesive. Cut around logo. Lay entire thing atop piece of red fondant. Then drape the red fondant on the rest of the jersey appropriately. Do ALL this before the fondant dries (about 5ish minutes), otherwise the logo won’t drape nicely and will be hard and flat. In this case, you WANT droopy fondant, since it’s supposed to simulate clothing. 5. Put several plastic tube supports into the cake. I had more than what is pictured below. That dog is heavy! STEP 7: Transport Dog to Event! No, seriously, driving in downtown Chicago traffic is unpleasant at all times, but especially unpleasant when you’re trying to protect a chocolate dog from moving about. 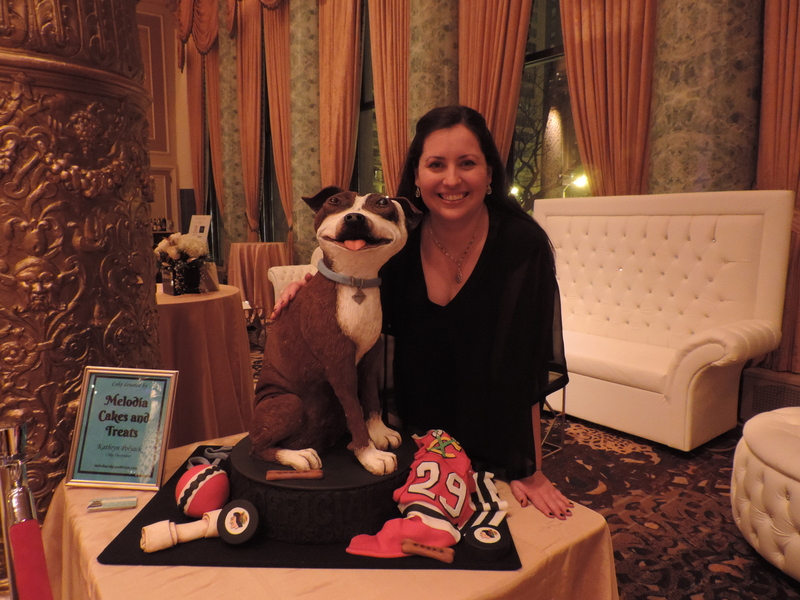 We definitely had the dog with me in the backseat, and the rest of the cake in the trunk. Luckily there were no sudden movements and she made it safely! The cart driver wheeled right into the ballroom, and there stood Bryan and Amanda Bickell. I paused in the entryway, because even though I was coming to their event, I was taken aback to see them there. They definitely recognized their (chocolate) puppy! Bryan doesn’t have his “nice-guy” reputation for nothing- he was as personable and genuine as they come. Aren’t hockey players the best?? What an amazing cake! What an amazing experience! This was awesome. Dog was fantastic , but the trimmings, sweater, puck, etc., we’re just unbelievable. What will you do next!?! This cake was amazing. One of the best I have ever seen. It must have taken alot of hours. Wow, thank you for the kind words! It did take a long time, but I love how it turned out of all the things I’ve ever made so far, this is by far my favorite! 🙂 Thanks again for reading and taking the time to comment!